Introducing the all new 2017 Ducati SuperSport - officially launched at INTERMOT 2016. SuperSport takes the energy and excitement of sport wherever it goes. From weekend roads to those of the everyday, via winding out-of-town paths: whatever your route, get ready to experience it in a new light. Contact Ducati Manchester or DMC Moto Preston or Ducati Stoke today for details. The lines of the SuperSport create dynamic shapes, visually compact and light. 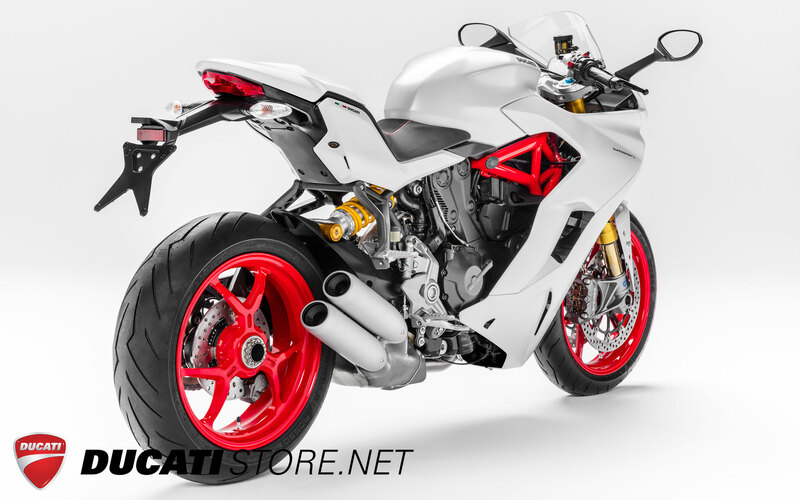 The design, sporty and elegant, integrates elements typical of Ducati sports bikes such as the single-sided swingarm, sculpted tank and compact lateral silencer with two overlapping exits, which leaves the rear wheel, with its “Y” spoke design, fully visible. The innovative front fairing makes for an uninterrupted aerodynamic profile that draws the eye to the sculpted tank and the volume of the fairing, where the trellis frame is left on view. The tail piece, separate from the rest of the fairing, adds sports elegance and ensures maximum aerodynamic efficiency. The Daytime Running Light with LED technology is one of the most characteristic sports-inspired details: a bright beam, unmistakeable in shape, that, as well as ensuring day-time visibility, sharpens the bike’s look. Always at ease, in and out of the city. Agile on urban roads, comfortable on the motorway and decisive when faced with out-of-town hairpin turns, the SuperSport combines comfort and versatility. Without ever compromising on its sporty nature. The Plexiglas screen, adjustable in height up 50 mm, ensures the right aerodynamic protection at higher speeds. This, together with the autonomy guaranteed by the 16 litre tank, amplifies the touring attitude of the SuperSport, making it an entertaining travel companion even on medium-range trips. The ergonomic triangle allows the rider and passenger to adopt a comfortable, relaxed riding position, ensuring that both enjoy maximum freedom of movement for a sensation of total riding control. Advanced electronic equipment allows the rider to personalise the SuperSport and optimise control. 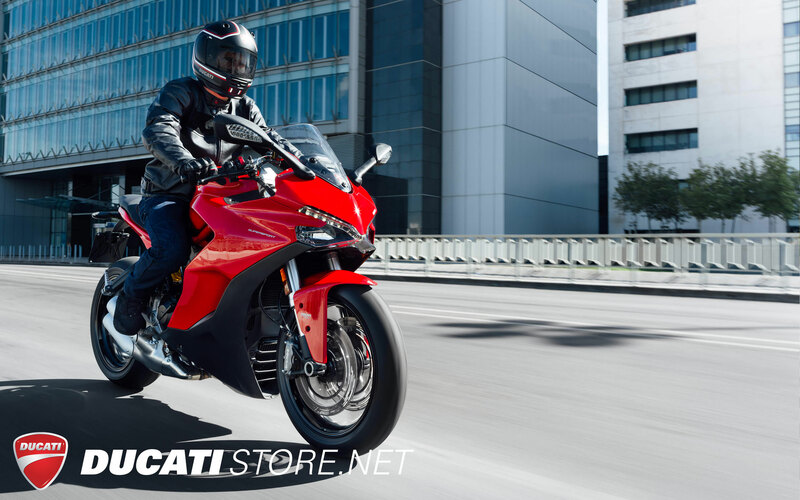 The Sport, Touring and Urban Riding Modes act on the Ride-by-Wire, the Ducati Quick Shift up/down and the ABS and DTC parameters to modify the behaviour of the bike and adapt it to individual riding style. 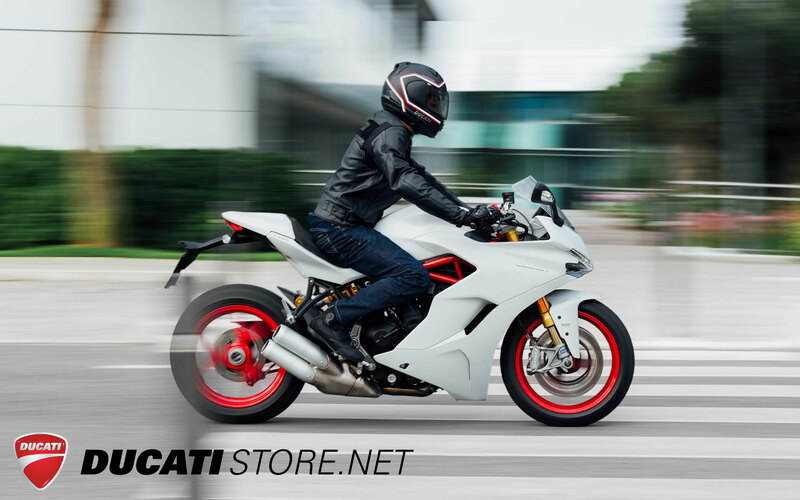 The Ducati Testastretta 11° 937 cc engine unleashes 113 hp at 9000 rpm and maximum torque of 9.86 kgm at 6500 rpm, of which 80% is already available at 3000 rpm. Sophisticated electronic management ensures full-bodied supply and an immediate, easy to manage response. 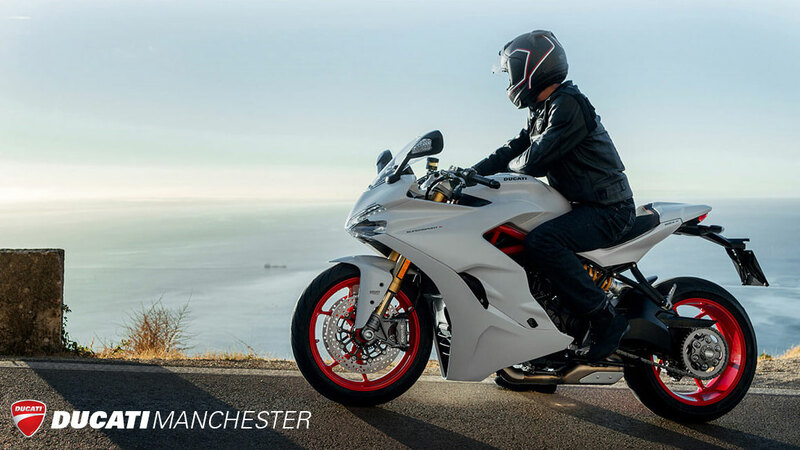 The Ducati Quick Shift up/down, included as standard on the SuperSport S, allows the rider to shift gear without using the clutch or closing the throttle, enhancing enjoyment during sports riding and providing a clear benefit in city traffic and on more winding roads. 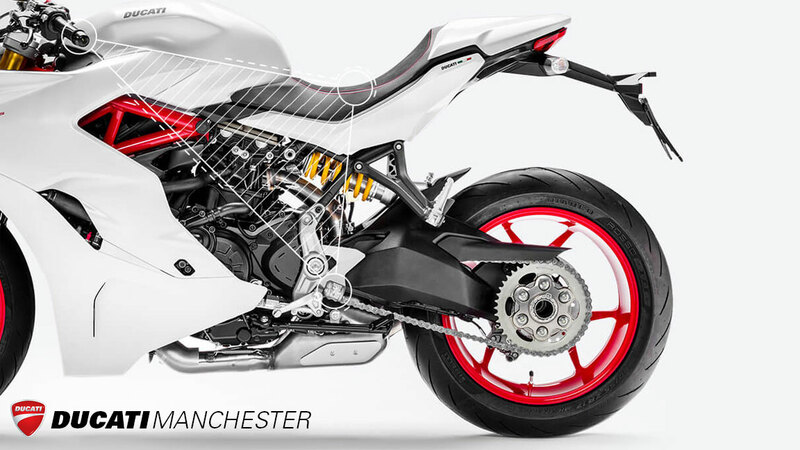 The SuperSport presents the latest evolution of the Ducati trellis frame, which uses the engine as a supporting element and contributes to keeping the kerb weight down to 210 kg. The chassis geometry and fully adjustable suspension, with 48 mm Ohlins fork (on S version) combined with the Sachs single-shock, make it a bike inclined to precision and control. The SuperSport perfectly balances sport and comfort to guarantee excitement and riding pleasure. Its handling, active safety systems and long maintenance intervals make it the perfect bike for those who want to experience the excitement of sports riding without compromising on comfort and versatility. 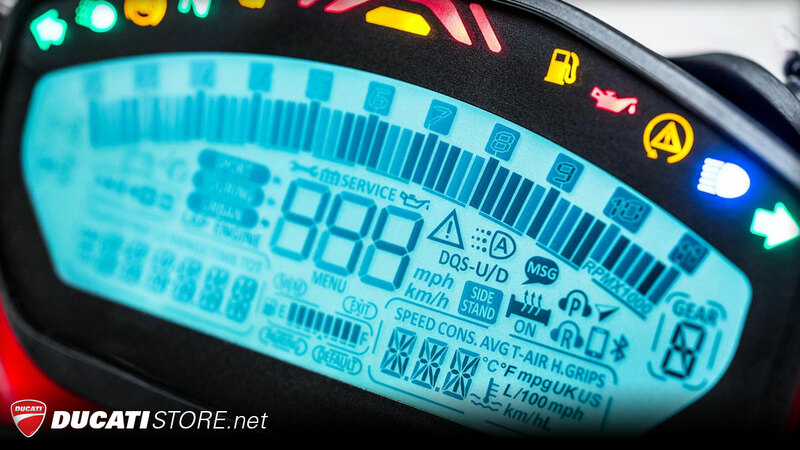 The display provides all information regarding the engine, consumption and advanced settings such as the ABS and DTC. It also allows you to select and personalise the three Riding Modes and manage music and notifications on your smartphone with the Ducati Multimedia System, available as an optional. The SuperSport presents a rich electronics package that increases the level of active safety. 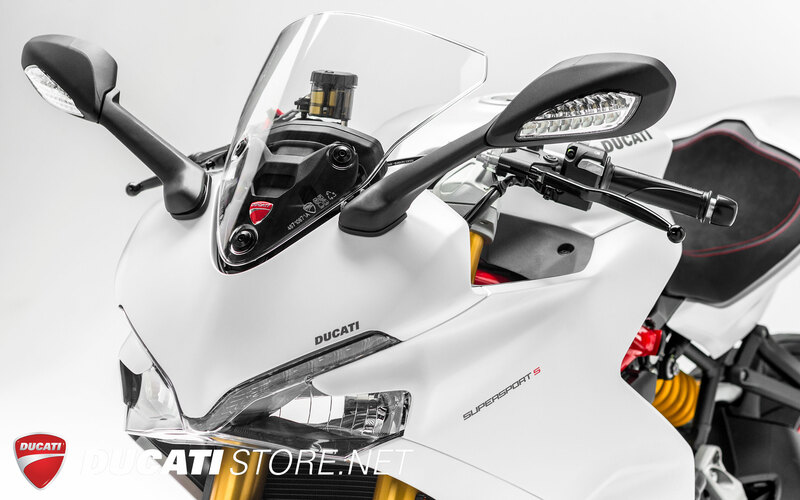 The Ducati Safety Pack (DSP), which includes Bosch 9MP ABS and Ducati Traction Control, enhances the bike’s performance and optimises control even on surfaces that offer less grip. The advanced materials and technologies of the Ducati Testastretta 11° engine guarantee particularly long maintenance intervals. With an oil change every 15,000 km or 12 months and a valve clearance check every 30,000 km, the SuperSport boasts values that are of absolute reference for its category. Excitement is just around the corner. Urban, Sport and Touring: three Riding Modes and just as many horizons to explore. Immerse yourself in a riding experience that amplifies every sensation, bringing the beauty and energy of any journey to the fore. The SuperSport is driven by the 937 cm³ twin Ducati Testastretta 11° that supplies a maximum power of 113 HP at 9250 rpm. For this application, the engine has been especially redesigned with a new crankcase, new heads with different water passages and an alternator cover with a specific design for the mounting of the new gear sensor. The engine and injection control systems are also brand new for this engine type. Euro 4 homologated, it boasts four valves per cylinder, a secondary air system, liquid cooling, a 12.6:1 compression ratio and bore and stroke values of 94 e 67.5 mm respectively. One of the most appreciated features of the Ducati twin are its long maintenance intervals: every 15,000 km or 12 months with a valve clearance check every 30,000 km, values of absolute reference for its sector. 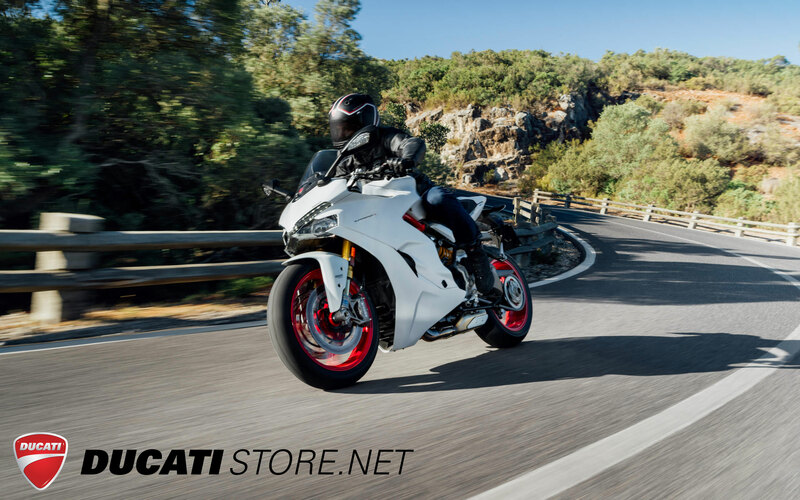 The engine is equipped with a six-speed gearbox with a new gear sensor that allows the SuperSport range to benefit from the advanced Ducati Quick Shift (DQS) up/down system, as standard on the SuperSport S and available as an accessory for the SuperSport. The mechanical cable clutch, requiring less exertion on the lever, is an oil bath clutch with anti-wheelie function that allows the bike to remain stable even during the aggressive up-shifting typical of sports riding. 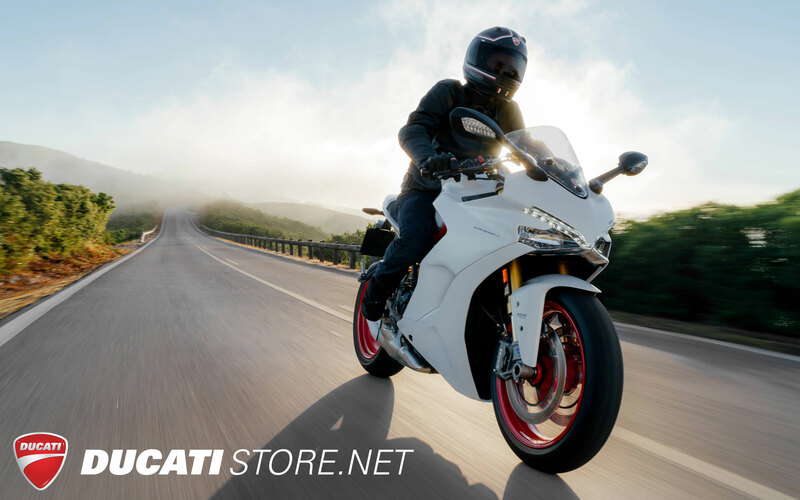 The Ducati Testastretta 11° twin supplies up to 113 HP at 9250 rpm and develops full, hefty torque throughout its entire operating range, ensuring a prompt response to any command from the throttle, a fundamental characteristic in terms of its road use. 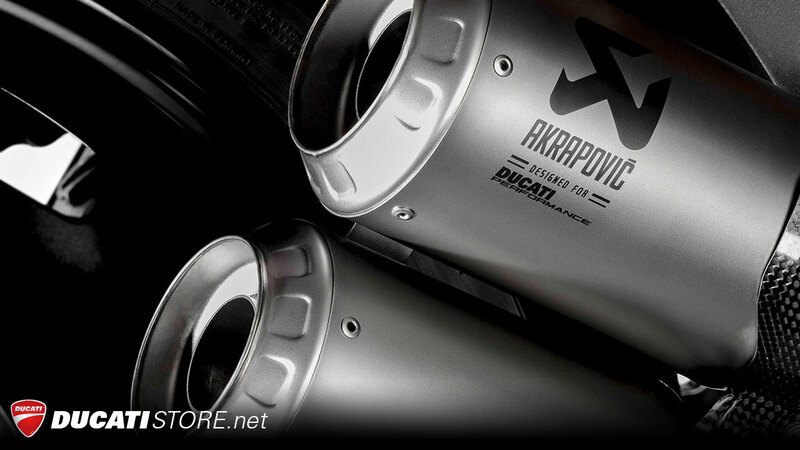 At 3000 rpm, more than 80% of the maximum torque is already available, reaching a peak of 9.86 kgm at 6500 rpm. The engine is a structural element of the frame. A choice that pays off both in terms of aesthetics and functionality. 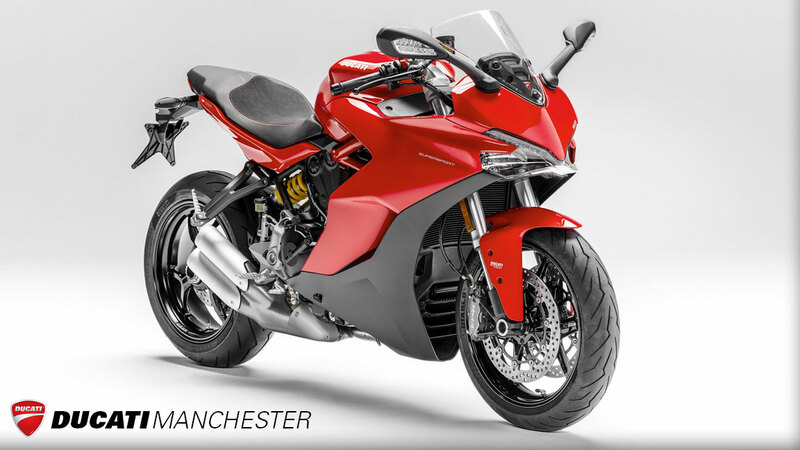 The structure, compact and lightweight, highlights the dynamic qualities of the SuperSport and helps maintain its dry weight of just 184 kg, or kerb weight of 210 kg. The wheelbase and head angle and trail make the bike agile and quick, but also stable, when leaning in. A real sportsbike, the SuperSport is equipped with a single-sided swingarm in die-cast aluminium that gives it rigidity and a reduced weight. The fully adjustable suspension differs for the SuperSport and SuperSport S models. The first has a 43 mm-diameter Marzocchi fork at the front and a Sachs single shock at the rear. The SuperSport S is equipped with fully-adjustable refined Öhlins suspension, with a 48 mm fork at the front and a single shock with integrated gas tank. The SuperSport is equipped with the aggressive Y design, three-spoke alloy wheels. The 3.50x17 wheel at the front and the 6.00x17 at the rear mount 120/70 ZR 17 and 180/55 ZR 17 Pirelli Diablo Rosso™ III. This latest-generation tyre is the direct successor to the DIABLO ROSSO™ II, from which it inherits its compound quality, excellent grip in all conditions and wear-resistance. DIABLO ROSSO™ III presents new profiles, latest-generation materials and an innovative structure that increases its handling and grip, raising the performance offered by a road tyre to a higher level. The characteristic “lightning bolt” tread design, an evolution of that of the famous DIABLO™ SUPERCORSA, ensures the tyre is compact, with a better full/empty ratio and greater efficiency in terms of water drainage, qualities that are particularly useful during road use. During sports use, the SuperSport brings dynamism and emotions to the fore in true Ducati style, thanks to a generous lean angle of 48° that ensures limitless fun. A result achieved also thanks to the agile chassis geometry and the choice of the 180/55 size for the rear tyre that combines handling and traction. The front brakes of the SuperSport mount Brembo M4-32 monobloc callipers that act on two discs, 320 mm in diameter, activated by a Brembo PR18/19 radial pump with separate tank and adjustable lever, typical of sports models. At the rear are 245 mm discs, activated by dual piston Brembo calliper. The braking system is managed by the Bosch 9MP ABS system with three maps that can be deactivated when necessary. The Bosch ABS system is a 9MP with integrated pressure sensor that can be deactivated or adjusted according to 3 increasing levels of intervention, which can be associated with the Riding Modes. Level 1, recommended for very grippy surfaces, offers track level performance with intervention only at the front. With the next levels, the ABS acts on both wheels, supporting riding on surfaces with less grip with the anti-wheelie function at the rear. Ducati Traction Control is an advanced system that identifies any rear wheel sliding and intervenes to control it, based on eight different profiles that ensure different tolerance values, to be selected according to the rider’s riding ability. Even if set up for the three different Riding Modes, the level of DTC intervention can be personalised or completely deactivated. The Ducati Quick Shift (DQS) up/down is an electronic system derived from racing that allows for gear changing and shifting without using the clutch and without closing the throttle when up-shifting. Helping the rider to save precious seconds in acceleration and avoid distractions during corner entry, the system is particularly useful in city traffic, while also ensuring greater enjoyment during sports use. The LCD display transforms the SuperSport’s dashboard into an advanced control panel via which the rider can easily access information regarding the engine, consumption and settings such as ABS Bosch and DTC. The display also allows for configuration of the Riding Modes and visualisation of Ducati Multimedia System information, which, thanks to Bluetooth technology, connects the bike to latest-generation smartphones, allowing the rider to control certain functions, manage the music player or receive notifications about incoming calls or messages received. In terms of equipment, the S takes things to another level: even more sport, even more design and more technology to accentuate the sportiest side of the SuperSport. As standard: Ducati Quick Shift up/down, passenger seat cover, 48 mm Öhlins fork with TiN coated inner tubes and a single-shock with integrated gas tank, both fully adjustable. The essence of the SuperSport world: two-tone Ducati Red and Mercury Grey fairing, Ducati Red frame, Glossy Black wheels, fully adjustable 43 mm Marzocchi fork and adjustable Sachs shock. 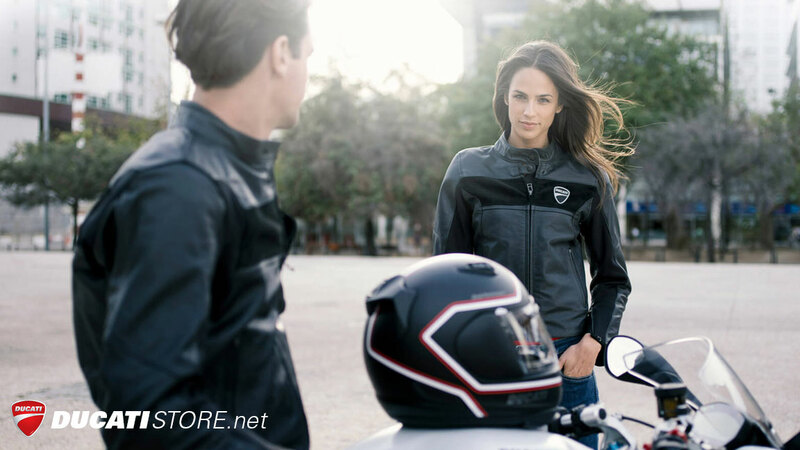 The range of garments to wear while riding the SuperSport reflect its character, for a balanced combination of urban comfort and sports performance. Your passion for sport can now be expressed in new ways, as SuperSport makes for a style ecosystem, to ride, to wear, to live. Dress it to suit your character. The new SuperSport boasts a line of accessories that draws from both sport and touriong worlds, ranging from carbon parts and Akrapovič titanium silencers to sets of bags and seats that markedly improve the riding experience. The new SuperSport is a bike for those eager to ride sports-style on everyday roads. 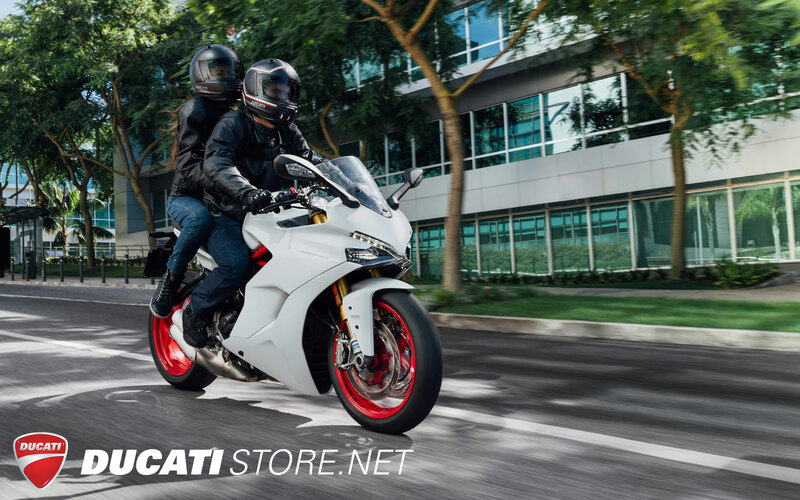 Fun, versatile and accessible, with true Ducati sports styling and zest, the SuperSport promises exciting, fun riding sensations while ensuring everyday comfort and easy handling whatever the roads are like. Book your SuperSport Test Ride today - We always have a selection of Demo bikes available (Please call us for availabilty). Supersport is available in Ducati Red. 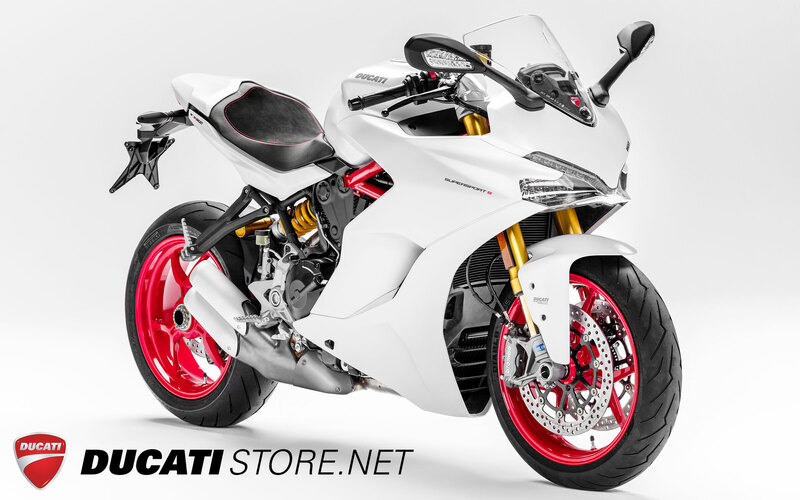 Supersport S is available in Star White Silk or Ducati Red. ORDERS BEING TAKEN FOR EARLY DELIVERY.